TGIF! Are you ready for the weekend as much as I am? I have tons of yard work to catch up on but I’m taking time out from that because I’m excited about my new glitter spray paint! I bought it a few weeks ago and I’m finally going to try it out! Since my peonies have begun to bloom, I decided to make a few matching vases using a pickle jar, a spaghetti sauce jar and an old vase or two. 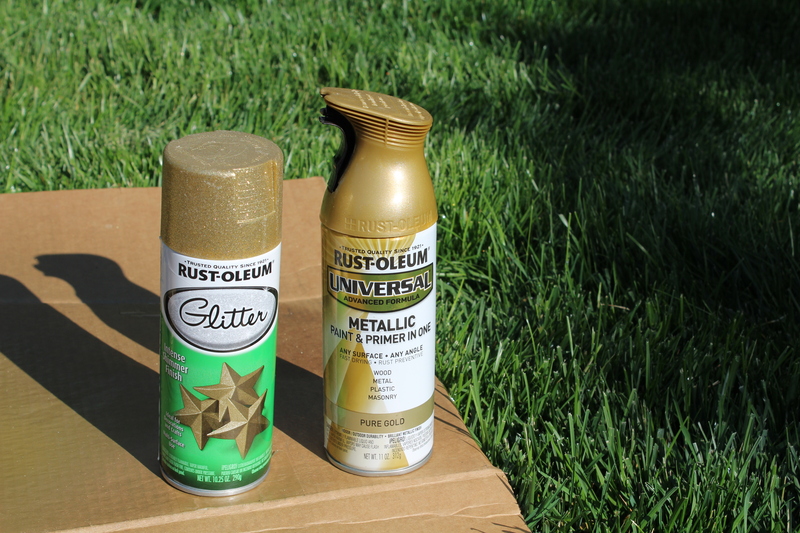 I thought it would be cool to try out this new glitter paint by Rust-Oleum. The can claims an “intense shimmer finish, ideal for decorations and crafts.” What could be better than glitter in a can? Right? So, I prepped my pickle jar and spaghetti sauce jars by scraping off the labels with my razor and removed the residue with Goof-Off. I washed and dried them. All ready for glitter paint! I shook the can of glitter spray paint according to the directions. I did a test spray on the cardboard just to see what it would look like. (One of those live and learn lessons over the years. Do a test spray first.) Well, it came out clear with gold glitter. From the looks of the can it looked like it was gold paint with gold glitter. So, I decided to paint the jars with gold paint and come back with a coat of glitter paint. For the base coat I used Rust-Oleum Metallic paint in Pure Gold. I painted all of the jars and vases with gold. Then I tried to spray paint the glitter on top but the glitter can was clogged. Big time. No amount of shaking, turning upside down, running under hot water, poking it with a needle worked. So, either I got a defective can of glitter paint or it is a serious design flaw. I mean, by its very nature glitter is chunky so wouldn’t you make a bigger hole in the can for the glitter to come out and not clog? Other than having sparkly fingers and fingernails from the test spray, my vases remain glitter free. (When will I learn to wear gloves?) However the jars are gold & shiny thanks to the metallic spray paint. I plan on returning this can of glitter paint to the hardware store where I purchased it. I’ll swap it for a new can and give it another try. It’s a great concept. If it works then I’ll give all of the jars and vases a coat of glitter! Meanwhile, aren’t my peonies gorgeous? I can’t get enough of these beauties! They tend to be top heavy so when they pop open, I cut them and bring them inside to enjoy.